1. Do you want to attain financial freedom? 2. Do you want to earn income in foreign currency ? or own a home you can call yours? 3. Do you want to be free from exploitation by private business owners where you don't even have time for yourself? 4. Do want to be free from continuous underemployment & joblessness? 5. Do you want to be free from landlord's wahala & harassment when you might have retired from active service? 6. Do you desire to live a better life with improved standard of living? If your answers to these questions are yes, then, this seminar is for you. 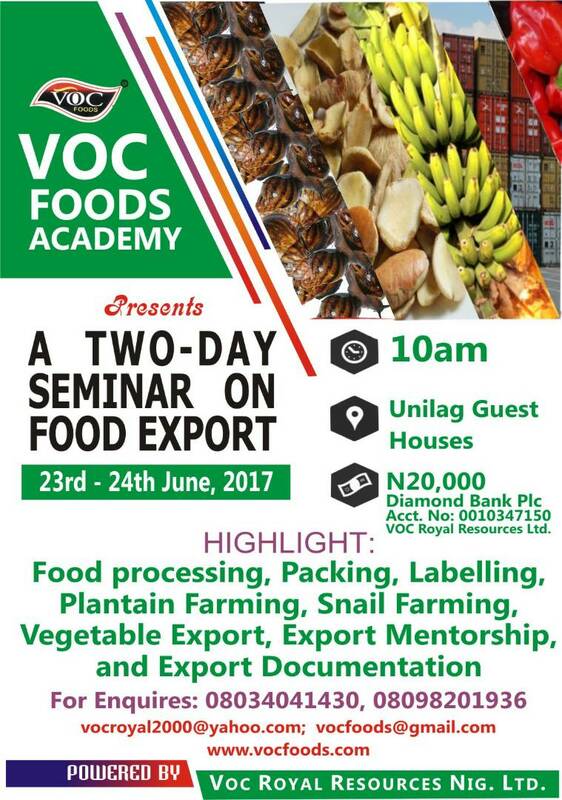 VOCFOODS will be offering a 2days training and exporting programme. 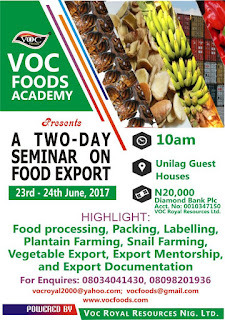 AND EXPORT OF NIGERIAN FOODS AND AGRICULTURAL PRODUCTS. VENUE: COMMITTEE ROOM C. UNILAG GUEST HOUSES, AKOKA.